Yoga has become popular as a lifestyle by itself within the health and wellness sphere and for good reason. There are unending benefits for undertaking a daily yoga practice. Some benefits of yoga are merely for the feel good vibes which aren’t to be discredited. 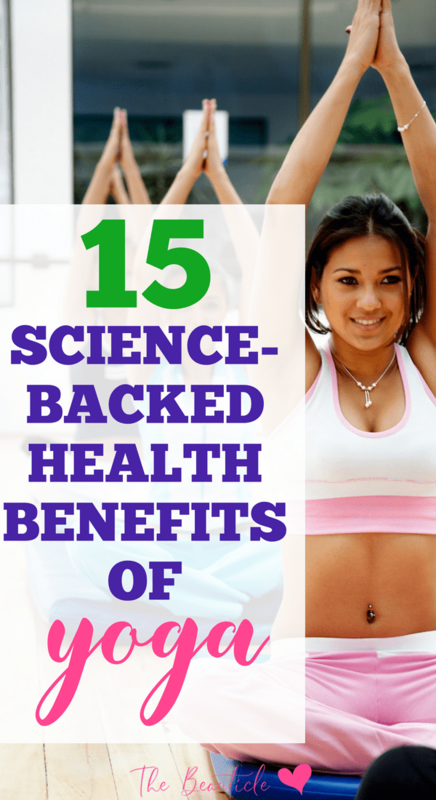 Some benefits however can be proven by science and this article will outline several of them. A recent study found that yoga had cognitive benefits on students when a yoga class was substituted for a standard physical education class in a high school. Participants who took yoga instead of physical education were found to have more stable moods and were more accepting of their surroundings than students who took physical education classes. Of course, an adult’s mind will hopefully be different from a teenage mind but if you are interested in yoga as a way to become calmer and more accepting, this study certainly suggests that it might be better for you than other exercise like running or weight training. In addition to increasing calmness, yoga has a number of more physical benefits as well. According to an article published by the National Institute of Health, also in 2012, practising yoga as an adult may lead to better sleep, digestion, and overall physical function. Like the article from the Journal of Developmental and Behavioral Pediatrics in the first point, this study was conducted within a particular age group, but that doesn’t mean that the takeaway the benefits can only be achieved by people in exactly the same stage of life. Is feeling like you’re healthier good for you? Without getting into a conversation about the importance of the placebo effect, many people give up on their exercise because they don’t feel like it’s paying off. This study found that people who practised yoga were more likely to feel like they were healthier than people who weren’t practising yoga. Also, unlike the above studies which involved fairly small and focused populations, this study involved over 4000 participants between the ages of 17 and 81. It’s certainly possible that these individuals weren’t as healthy as they felt just because they were doing yoga, but doing yoga made them feel healthier and feeling healthier likely helped them to keep doing yoga. Even if yoga isn’t your whole exercise routine – and it probably shouldn’t be – incorporating yoga into your workout routine may help you to stick to it. In 2011, this study involved 22 diabetic participants who practised yoga for three months. At the end of the trial, participants had lost weight, increased their metabolism, and even had decreased insulin requirements compared to a control group. While non-diabetic readers may not care much about decreased insulin dependence, the study certainly bodes well for individuals hoping to lose weight and increase metabolism through their exercise, and that’s probably the case for most of us. A 2005 study found that when 101 adults with chronic lower back pain practised yoga for 12 weeks or practised a more conventional exercise routine and read a book about pain management, those who practised yoga were better able to manage their back pain. Similar to the case of diabetic patients, not all readers are looking to yoga as a way to manage chronic pain, but yoga likely helps with chronic back pain because of its ability to stretch and strengthen muscles, which is likely of interest to everyone. If kale and berries are the superfoods of nutrition, yoga is the super exercise of overall wellness. Yoga has over 5,000 years of fantastic health benefits that help to alleviate stress, lose weight, and even fight disease! If you think yoga is only random stretches and breathing, you’ve already seen that science has proven you wrong. Now let’s take a look at 10 more amazing health benefits of this ancient activity. Yoga is all about being mindful of where your body is in space while breathing. It is moment focused which helps to eliminate undue anxiety. Since yoga has such an emphasis on mindfulness, it’s no wonder that consistent yogis consume nutritious foods to fuel their mind. Binge and mindless eating is a form of losing control. Because yoga is so focused on being mindful of your body and breathing, it’s no wonder that those habits can trickle into your eating routine. Certain yoga poses promote blood flow and circulation throughout the body. When this occurs, pain from diseases such as sciatica, fibromyalgia, and even a women’s menstrual cycle is reduced. This holistic approach provides relief and dramatically reduces inflammation in the body. Yoga can assist with controlling how you react to and approach challenges. The calming effects of meditation while engaging in yoga poses creates a sense of relaxation that encompasses the body. Yoga instructors teach their participants the importance of manifesting their words into existence. By speaking mantras such as, “I am one with my body. I am at peace,” they are allowing those emotions to come to fruition. The slight movements of the body from one pose to the other requires strict attention to how your body is moving in conjunction with breathing in an appropriate manner. Because you are directing all of your attention towards getting your poses right, this leaves little room for distraction. By participating in yoga on a regular basis, this attention spills over and you will improve your focus while performing daily activities. From a literal standpoint, yoga encourages you to maintain your balance while holding poses for 20 to 30 seconds. Aside from the physical aspect, yoga also encourages connecting the mind, body, and soul. Yoga was originally created as a means for individuals to purge themselves of their ego and further develop their true self. This involved centering the mind with calmness and improving concentration. When you engage in yoga, you are bringing together all aspects of your being with the hopes of reaching balance. By regularly participating in yoga, you are encouraging blood and oxygen circulation throughout the entire body. In addition, research has proven that yoga can elevate red blood cell counts in the body. Through this body regulation, your endocrine system functions on a higher level, sodium levels are lowered, and you can even boost your immunity! Yoga requires total body strength in order to remain in your position correctly. Poses such as Chair and Swan require your core and arm muscles to work together. By regularly engaging these muscles, you are building your literal strength. From a mental perspective, yoga isn’t as easy as one assumes. Many of the poses are quite difficult in nature. When you stick with your regimen despite challenges, you are building endurance. A study published in the Yoga Journal explained how yoga can assist with raising gamma-aminobutyric levels in the brain. When your brain is lacking these levels, diseases like Alzheimer’s and Dementia are likely to occur. However, engaging in strengthening yoga exercises can help to prevent these illnesses. Anxiety occurs when the mind constantly wonders about the future and focuses on an unresolved fear. Yoga can help to promote mindfulness which reduces certain conditions such as Obsessive Compulsive Disorder, depression, and anxiety. Individuals who suffer from insomnia or have trouble falling asleep may benefit from engaging in yoga poses. The calming effects of yoga can have a great impact on the brain system that controls sleep. Engaging in certain poses specifically designed for sleep can help bedtime become effortless. Yoga has a multitude of uses and benefits that range from mental to physical. By creating your own yoga routine, you will begin to reap the benefits of this ancient practice!